Using this tool you can more easily compare ships to determine how ships of the same class stack up against each other or to quickly filter ships by transport ware class, weapon, or missile capability. No longer will that new purchase of yours reveal an unexpected weakness*. 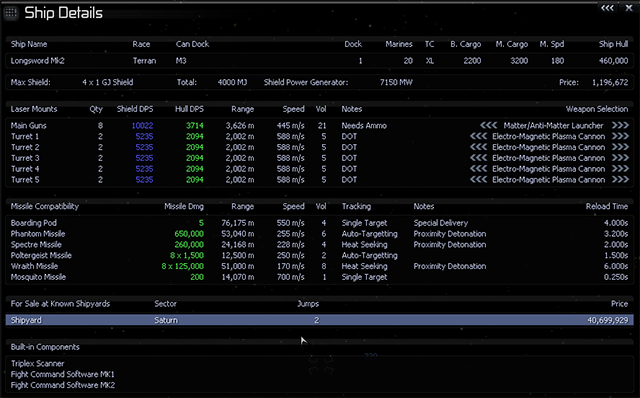 By default the ship browser only lets you compare ship types that are known to the player to prevent any spoilers. Ships highlighted in green can be purchased based on current notoriety. Combat page - Shows Main Guns/Turret Counts, Weapon Energy Pool, and Shield Generator strength. Closing and reopening the ship browser should remember the last settings chosen. 1. Purchasing the best ship you can buy for a given task - great early on when purchase options are limited and you don't feel like grinding notoriety. 2. Planning your next 'acquisition' or deciding which race you want to grind notoriety for next. 3. Great for total conversions where ship stats no longer match the vanilla and may not be easily googled. 4. Useful for those working on their own ship mods to balance stats and quickly spot mistakes. * The only weakness a ship might have that can't be determined quickly via script is the weapon energy reload rate. ** Weapon filter not limited to main guns. Keep that in mind when looking at M6/M7s. *** Docking class types has nothing to do with docking counts. At this time there is no quick way to determine how many ships of a given type can be docked. If the docking class is not a M5-M3 assume the ship may only be able to dock at most 1 of the shown types. For example, the screen shot shown above the Tepukei only docks 1 M1. You cannot dock 23 of them. For brevity anything that can dock an M1 can also dock any other ship type in that same slot. So if you dock a TM you may not be able to dock an M1 if the ship in question only has that one cap ship docking port. Also, anything that can dock a TS can also dock a TP. Last edited by zanzal on Mon, 15. Dec 14, 02:26, edited 15 times in total. This version of the Ship Browser is licensed as CC-BY-SA version 4.0 International. You have the right to modify and release modifications without asking me. You don't need to get my permission or notify me in any way. You are obligated to mention Zanzal as the origin of the script and to provide others with these same rights and obligations to your modified version (they would have to mention your name as well as my name in their modified versions). You may only combine this script with a larger work if your larger work also shares a compatible license that meets these obligations and confers these rights. Modified versions must not be released under the exact same name to avoid confusion (You must call your modified version of the script something other than 'Ship Browser'). + Changed rules so that being known to the player will allow the ship to be shown rather than requiring the player to know where to purchase the ship. + The ship details screen is shown in this version, but it is a work in progress. More to come in future versions. + Fixed bug in Vanilla showing XRM's ware transport classes. Last edited by zanzal on Sun, 7. Dec 14, 22:26, edited 13 times in total. I'd fraking kiss ya. This really saves tons of time moving around in the ingame encyclopedia when compare bunch of ships. One more question before I actually try this. I'm running XRM with a modded Tships since I've added some ships that didn't come with XRM. Will this script still works? Just kidding man, but thanks for this! Spectre01 wrote: One more question before I actually try this. I'm running XRM with a modded Tships since I've added some ships that didn't come with XRM. Will this script still works? It should work fine with custom ships since it doesn't make any assumptions about the game files. Well you never know what might show up in a future version. Thank you. Very nice, very useful. Great idea for script! Maybe I am doing something silly, but after install with plugin manager there is so control option for 'Ship Browser' in game. This is for X3:TC. R2dical wrote: Great idea for script! Maybe I am doing something silly, but after install with plugin manager there is so control option for 'Ship Browser' in game. This is for X3:TC. I normally don't support TC, but I have posted a special 'TC Edition' that contains some quick fixes to make the current version of the ship browser work under TC. Feel free to report back any problems. The TC version is a final version and will not receive any enhancements since I don't ever play TC myself. Works fine in X3AP/XRM. Thanks! I found it. To solve this problem (which seems to be language related and so only relevant for a non-english game), you have to copy the file 8103-L044.xml to 8103-L049.xml (in the addon\t folder) and change the id attribute of the language tag in line 3 from "44" to "49". Now I can see the text correctly within my german X3: AP game. Maybe you want to use this for the next version of your script. I can't see any ATF ships in the ship browser. Why is that? Good idea. I've just started rebuilding a custom setup for a new X3AP game start. I'll give the mod a quick update in a couple days. There are a few improvements I want to add as well. So next version will add a german language text file for the next version update.